If you think going to your local kitchen and bath showroom is overwhelming imagine walking the halls of two convention show halls totaling over 400,000 square feet and over 600 vendors and try to figure out which products are the best for your clients! It can be mind-boggling but I love every minute of working the KBIS show. If you are a designer in the kitchen and bath industry, I cannot stress enough how much you need to go to KBIS annually. KBIS is where all the new products, technology, and trends are introduced not to mention the amazing educational opportunities with great speakers and industry icons, like Cindy Smith, Editor in Chief of Interiors Magazine, who gave the most amazing keynote ever! CLICK HERE TO CONTINUE READING & FIND OUT WHAT THE TRENDS WERE! The trends I saw at KBIS this year, were just beginning to emerge last year so it was really interesting to see them in full force at the 2018 show and to see how advanced things had gotten since last year. I will only discuss what I consider the top five trends, but there were many others, which I may share at a later date. This post will highlight five trends I thought were most prevalent at KBIS 2018: Smart Home Technology, Matte Finishes, At Home Spa Bathrooms and Black Cabinetry. Let's look at the individual trends and discuss I saw at the show in Orlando. But first a little joke!. Don't we all kinda feel like this if we are over the age of 45? 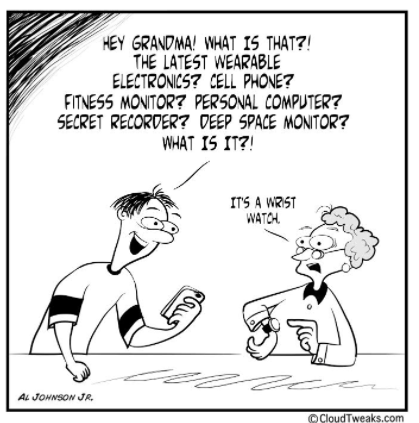 Every day there is a new gadget. Sometimes it feels like we need a specialist to keep us up on what we need! Some people embrace new technology while others fight it. Which do you do? If you fight it, you may want to reconsider that argument because things are changing rapidly folks and if you don't get on the bandwagon, you are going to be left behind! 1) Smart Technology I would say Smart Home Technology was the most talked about trend KBIS 2018. Why? Smart Home technology can be a major time saver in many ways. Of course, like any product, you must decide what works for you and what doesn't. Not all smart technology is needed for the way you live, but certain key types of technology which support your lifestyle can make amazing changes that can put more time into your schedule. Do you enjoy smart technology or are you bothered by it? Let's take a look at some smart technology products that debuted at KBIS. 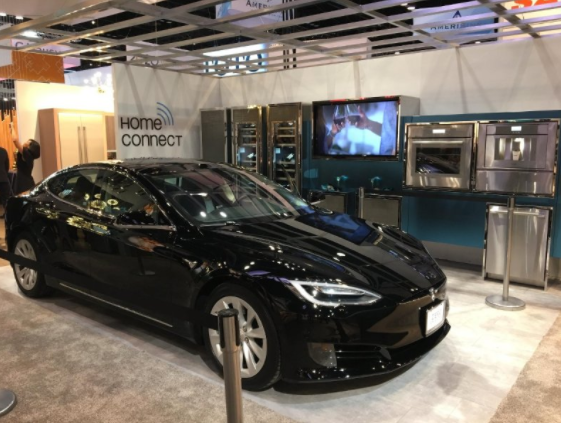 The Thermador /Tesla Kitchen Home Connect System! Thermador is always a leader in their industry. Did you know that Thermador was the first appliance company to introduce stainless steel and the others followed? It's true! Also, did you know that Julia Child cooked on Thermador in her own kitchen? She did! I mean come on, if it is good enough for Julia, we certainly need to stop and take notice, right? Wonder what Julia would say if she could save the time it normally takes to heat up the oven while she was driving home from work? When Thermador talks, I listen! Why? Because they are the "Stander Setter" in the appliance industry in my book. So, let's take a look at Thermador's Smart Technology. In the Thermador showroom, we were introduced to the Thermador Connected Experience by Home Connect, an industry-exclusive app. Home Connect amazingly provides culinary assistance to consumers with Kitchen Stories, a unique app that can provide recipes, as well as video tutorials and even wine pairings for your favorite recipes. Home Connect will also allow you to remotely control your Thermador appliances through other brand partners like Amazon Alexa. What does this app connection do you ask? It will allow you to check the contents of your frig when you are in the grocery store so you know whether you need more milk or eggs which can cut down on trips to the store. You can allow connecting to Amazon dash inventory and have groceries delivered as needed if you are like me and hate going to the grocery store. The coolest connected app everyone was oohing and ahhing over was Eve, which is Tesla's connected vehicle software. What does this do? It allows you to brew yourself a coffee on your way home from the gym in the morning so when you arrive your coffee is waiting for you! It also allows you to turn on your oven from your car on your way home from work so there is no waiting for an oven temp to heat up once you are home. Is this something you can live without? Why yes! But then we all use to live without Netflix. Can you imagine life now without Netflix? Thermador launched way more than smart technology at KBIS 2018. 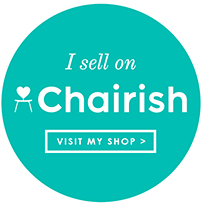 They launched over 300 amazing new products, which I will save for a separate post! If you are like me you will want to yank out all your old products to replace with their new ones asap! Cannot wait to share my favorite new Thermador products with you in another post! As well as share the amazing "One Republic" party Thermador threw at KBIS. Look for that to come soon! of their SuperSteel Infinity finish with black accent. 2) Matte Finishes - From Appliances and countertops to plumbing fixtures matte black was the color story of KBIS 2018. 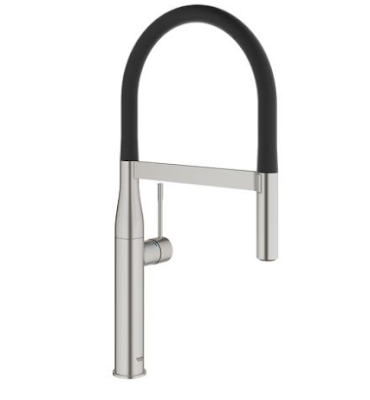 Shown here is the hansome Lyndon matte black faucet from DXV. and the Grohe Essence Faucet in their supersteel finish with black accent. 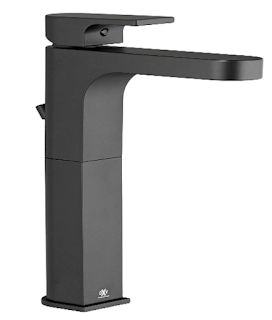 Every plumbing fixture company had matte black or black accents in their product line. I think black comes as "the great equalizer" when consumers are confused about which metal finish is in and which is out. Black is handsome, sleek and allows any metal finish desired to be used in tandem. I know I'll get emails asking if brass or nickel are out and the answer is no! All finishes are still viable. I'm just talking the stand out KBIS trends right now. Brass is softer finishes like satin brass or unlacquered brass and nickel as well as chrome are still around. As far as matte appliances, LG invited us to "Embrace the dark side of our kitchens" with their entire suite of matte black appliances. So now you are going to ask me if stainless is passe', right? No! Stainless has been around forever and won't go anywhere. Stainless is classic but it is trending to offer other options in appliances. some companies are offering colors like LaCornue, Viking and Smeg to name a few. The matt finishes seem to be another option in the middle market that consumers can choose from to have an updated option without committing to a bright color or stainless. WilsonArt's Traceless Laminate in matte black offers a velvety smooth surface that will not leave smears, smudges or fingerprints on its surface. This product is great for countertops or for making furniture like shown above. 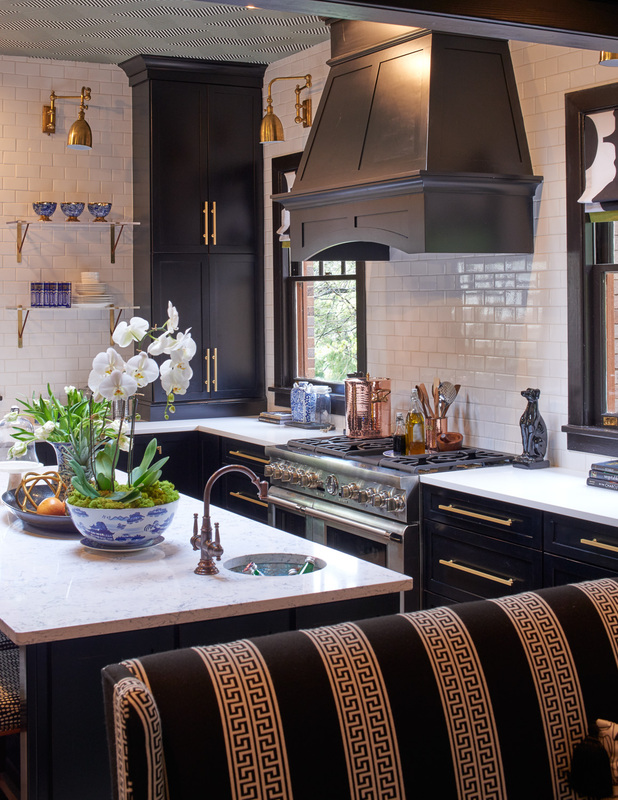 3) Black Cabinetry: This is actually kinda interesting to me as I did the kitchen above in 2015 and someone who used basically the same elements as I used in this kitchen won best of Houzz last year in 2017 for their design, but we won't get off on that topic. Black has finally edged out grey and white as a kitchen cabinet color. I predict by next year it won't be as big, but it certainly was trending at KBIS 2018. Almost every cabinet line had bad somewhere. Black is definitely having its hay day. Black cabinetry, as well as white cabinetry, are classic so I don't foresee them going anywhere so don't freak out if you just painted your kitchen white or black. Color in cabinetry is on the horizon but that doesn't mean the classic are passe' just not trending. The next trend which has been around for the past couple of years is "At Home Spa Retreat" and why not? I mean seriously, it is so easy to do now with the new products on the market. Doesn't every one want to live well and take care of themselves everyday? 4) At Home Spa Experiences: It is no secret that the "at home" spa experiences are bigger than ever. One of my favorite products I saw at KBIS was Mr. Steam. I have written about Mr. Steam before but since I am in the process of redesigning my own master bathroom, I was convinced Mr. Steam will be making an appearance in my new shower. The benefits of having a steam shower are simply too amazing to ignore. Why go to the spa when you can have a residential steam shower in your own home for under $2K? It is simple to install and can be retrofitted into an existing shower fairly easily. Did you know there is a place on Mr. Steam's website(click here) where you can input the dimensions of your shower and it will tell you what is needed to convert your shower into a steam shower? Of course, if you need a little design help, I know a willing designer you can call (me!). 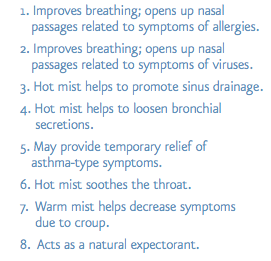 Here are eight benefits of taking a steam shower, but you can read all forty by clicking here. Please take time to read these, you will be amazed! Who doesn't want to burn off 150 calories by standing under a steam shower for 15 minutes? Duh! Beats climbing the elliptical for 30 minutes for the same outcome! As you can see from the photo above, the keypad for a steam shower is very minimal so no worries about having some ugly commerical controls. The keypad is sleek and simple. Make sure you pop over to Mr. Steam and find out all about this amazing product. Not only do you get steam, but you can also have aromatherapy as well as chromotherapy and music! Heck, once I get my installed I think I'm going to use it as my "adult time-out". The last trend I'm going to discuss is Architectural Elements. Remember the beautiful Metrie Doors I used in this project? 5. Architectural Elements - Everywhere I looked at KBIS there were offerings of decorative moldings, laser cut screens for window or walls, as well as moldings, doors and trims which can transform a boring room to a room with architectural interest. We are outfitting our homes in unique ways with woodwork. Whether you want to add molding on the ceiling, wainscotting on your walls or add interesting doors, there are companies with products to accommodate your needs. Those products can be applied quickly to create a custom looking room. One company who offered beautiful solid wood and composite wood trims, moldings and doors is a 92-year-old company named Metrie. I have used Metrie in my projects for a couple of years, so I was excited to see they were offering more products. Make sure to pop over to Metrie's website and check out their five collections: Fashion Forward Collection, French Curves, Very Square, Pretty Simple, True Craft. If you are a designer or trade professional sign up for their pro-access here. If you are a consumer, use the Metrie website to tell your design professional what types of moldings you would like to use in your projects. Either way, there is a ton of information on the Metrie website. 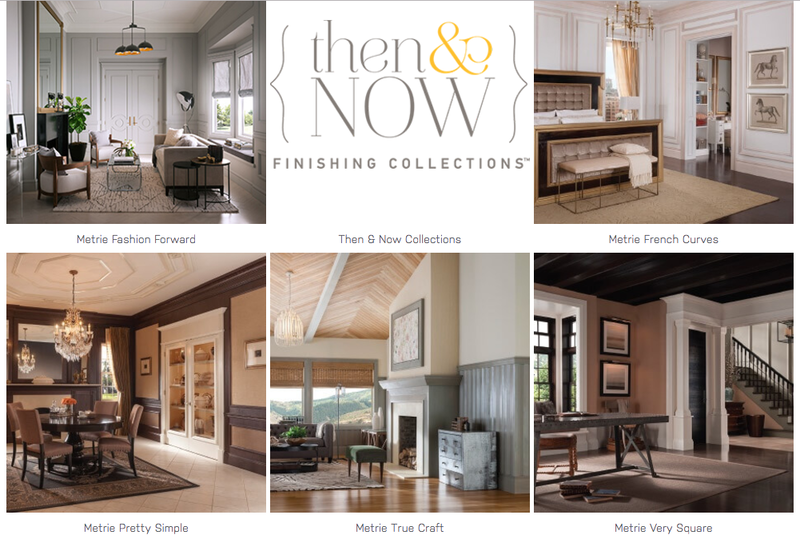 If you are looking for more inspiration make sure to check out Metrie's Then and Now Collection below as well as their inspiring blog The Finished Space, ! To find out where to purchase Metrie products in your city click here Please do visit their website to learn more about this amazing company! I hope my KBIS Trend Recap has given you something to think about and made you feel as though you were at KBIS? It was a great show and I have so much more to share, so this is just the beginning of other KBIS post coming soon! 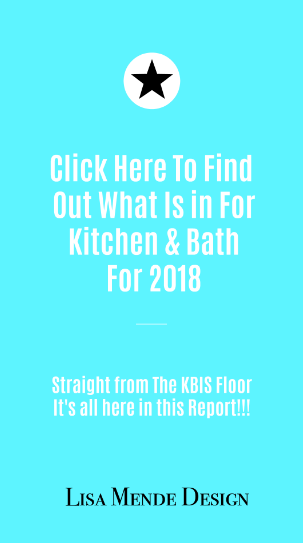 Want to Know What Companies and Products that Won Best Of KBIS 2018? "A HUGE THANK YOU TO MODENUS FOR ALLOWING LISA MENDE DESIGN TO BE A PARTICIPATE IN BLOGTOURKBIS 2018. " All photos are the property of Lisa Mende Design unless otherwise noted. Please do not use my photos without my consent. This is a sponsored blog post. Lisa Mende was a member of Blogtour KBIS 2018. All ideas are my own. I always work with companies I believe in and feel will be of interest to my readers. You will never read a post about a product or company I do not believe in on my blog. 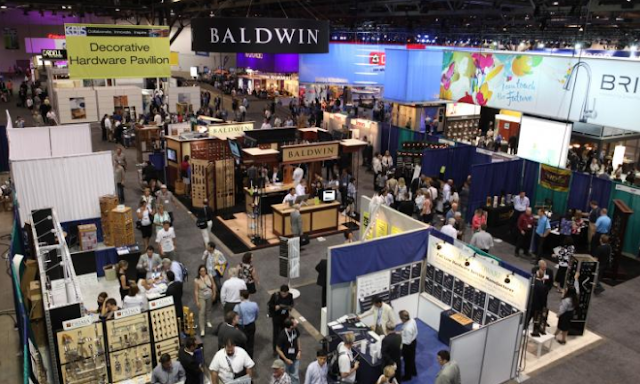 All the companies mentioned in this blog post were sponsors of BlogtourKbis.